There are tasks you can do every day to help avoid common hearing aid repairs each and every day. They are not very hard to do and take up little amounts of your time each and every day, but these simple tasks can help you to avoid costly repairs in the future so take heed. First, clean your hearing aids each and every day after each use. This simple task can help to decrease wax build-up in your hearing aids as well as wax build-up or infections in your ears. It literally takes less than a minute every day to wipe down your hearing aids and this simple and quick task can help to prevent costly repairs from wax buildup. Another simple task that takes even less time than cleaning your hearing aids is storing your hearing aids in a safe container when not in use. Proper storage helps to prevent damages, moisture attacks and even losing them when they are not in use. Quickly putting your hearing aids in your pocket for just a second could end up being a disastrous moment – causing you to crush or lose them without even realizing it. If you do not have the proper storage case with you, place them in a glass, sunglass case or another safe container where they will be protected. Finally, another way to prevent costly hearing aid repairs is to avoid moisture – any type or amount – at all costs. Moisture includes water, steam and even sweat. The best bet when it comes to moisture is to remove your hearing aids and store them in their protective case until you are clear of any and all moisture. Yes, even the tiniest amount of moisture can have devastating effects on your hearing aids, so error on side of caution and take the time to properly store them. Properly caring for and maintaining your hearing aids, in addition to safe storage and avoiding moisture, will help ensure you avoid any costly repairs. In the event you are experiencing any problems with your devices, don’t hesitate to contact your audiologist to have them evaluate your hearing aids for repairs. 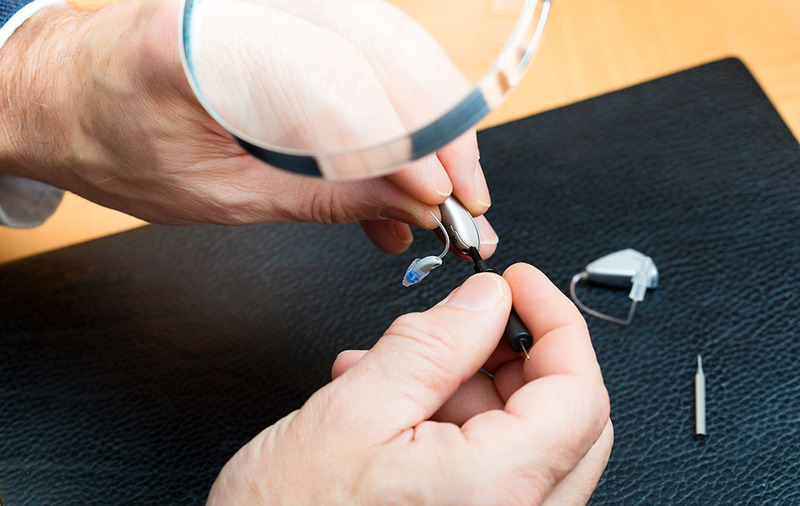 Your audiologist will be able to examine your hearing aids, perform minor repairs on site or send your devices to the manufacturer if necessary.